When my husband, Justin, and I flew to Tokyo for our honeymoon, it was our inaugural long-distance flight traveling as vegans. 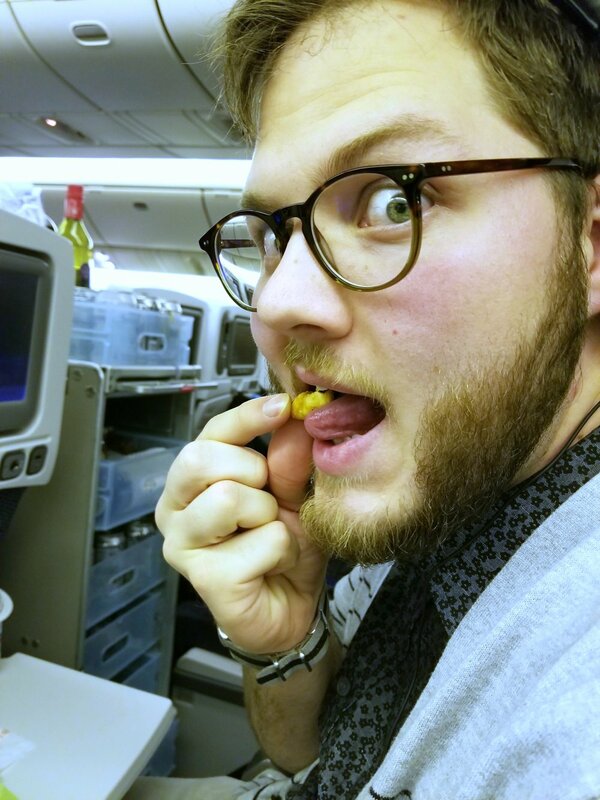 I had heard horror stories about eating on international flights (and Japan, in general) as a vegan, so to say I was nervous is a bit of an understatement. 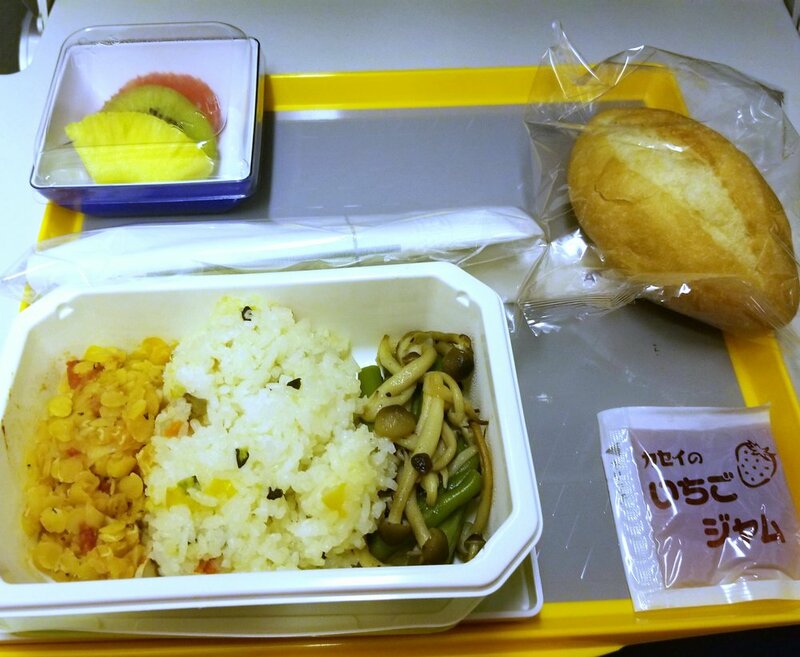 Making matters worse, I was unfamiliar with the airline we had booked, All Nippon Airways or ANA (which turned out to be the largest airline in Japan) prior to booking, so I had no idea if they were capable of serving vegetarian food, let alone full-blown vegan meals. We somehow lucked into a direct flight both ways, but, with about fifteen hours in the air, it certainly wouldn’t be ideal to subsist solely on our trusty go-to, Cool Mint Chocolate Clif Bars. Seeking input on what to expect, I had scoured the Internet prior to our flight for advice but only found a couple of paltry TripAdvisor reviews. So if you’re similarly clueless as to what’s coming your way on an international flight with ANA, don’t worry; I got your back. I called ANA’s hotline to order our tickets and confirm a vegan meal had been placed. After a short wait, a pleasant woman walked me through the process of selecting our flight, seats, and meals. When I asked for a vegan meal, she seemed a little bit perplexed and asked if I meant vegetarian or if I wanted their “strict vegetarian” selections. I indicated that Justin and I both did not eat meat, dairy, or eggs and she confirmed that I should order a strict vegetarian meal. I was bit worried she didn’t quite understand what I was asking for, but after chatting about our honeymoon for a bit, she told me she had actually tried veganism recently and had eaten a vegetarian diet for many years. Thus, I felt like I was in safe, veg-friendly hands. Note that ANA’s website has a helpful list of dietary restrictions you can order ahead of your flight, some of which you can either call them about or alternatively, enter through their online portal. One of their available dietary restrictions that you can order online is a Jain vegetarian diet; Jainism is a religion that originated in India and focuses on leading a life of non-violence and harmonious co-existence with other creatures, which includes following a plant-based diet. However, I know some Jains are lacto-vegetarians (i.e. consume plant-based products, as well as dairy products), so to be on the safe side, I would recommend giving ANA a call prior to your flight and explaining that you follow a vegan diet. After the booking process, I was pretty stoked to find out that our ANA flight arrived in Haneda Airport, which, until recently, only handled domestic flights. Located right outside downtown Tokyo, it was super easy to hop aboard a subway and make our way to our Airbnb in Shinjuku; after a 15-hour flight, it was beyond awesome to land someplace so centrally located. Had we arrived at Tokyo’s other airport, Narita, some 50 miles east of Tokyo, our journey to our Airbnb bed would have been at a minimum an hour and a half longer. So, if you can, I would definitely try to swing a flight that lands in Haneda to make your arrival in Tokyo as easy and convenient as possible. On both legs of our trip, a flight attendant, shortly after boarding the plane, confirmed our names and our vegan meal order, and placed a green sticker aside our chair backs to indicate our dietary choice to the other attendants. Our first dinner consisted of mostaccioli with a savory mushroom marinara sauce, two types of steamed veggie mixes (I believe mostly squash-based), a very simple side salad with oil dressing, a dinner roll with vegan butter, and a packet of Craisins. Despite my not-great photographs (when we went on our trip, I hadn’t known I was going to be launching a vegan travel blog! ), the food was actually tasty! Everything was served warm and tasted fresh, with a wide selection of dishes for each meal. Honestly, given our challenges of finding breakfasts in Japan, the breakfasts we had on ANA were downright yummy. If you (like me!) enjoy your food with some kick, though, I may recommend trying to track down some hot or soy sauce packets from the airport food court to bring aboard to kick the food up a notch. Furthermore, as someone who finds it virtually impossible to NOT finish my plate, you are given a LOT of food- I remember landing in Tokyo and feeling stuffed to the gills upon disembarking (...which did not stop me from eating a ridiculous amount of food there). Besides your meals, you are also given snacks intermittently throughout the flight. Shortly after boarding, everyone is given a rice puff snack (that was accidentally vegan!) and some type of snack-sized sandwich. On the flight to Tokyo, a flight attendant had (unbeknownst to us) removed our green sticker from our chair mid-flight, so we were given a ham sandwich (which we gave away to a very grateful Japanese man across the aisle). The original flight attendant, who had given us our Sticker o’ Veganism saw that our sticker, had been taken down and gave us a veggie and hummus sandwich. So, watch out to make sure your veggie sticker stays loudly and proudly on your chair back throughout the entire flight. Ultimately, sticker drama aside, my fears of starving and being eaten by wild wolves mid-flight were all for naught. 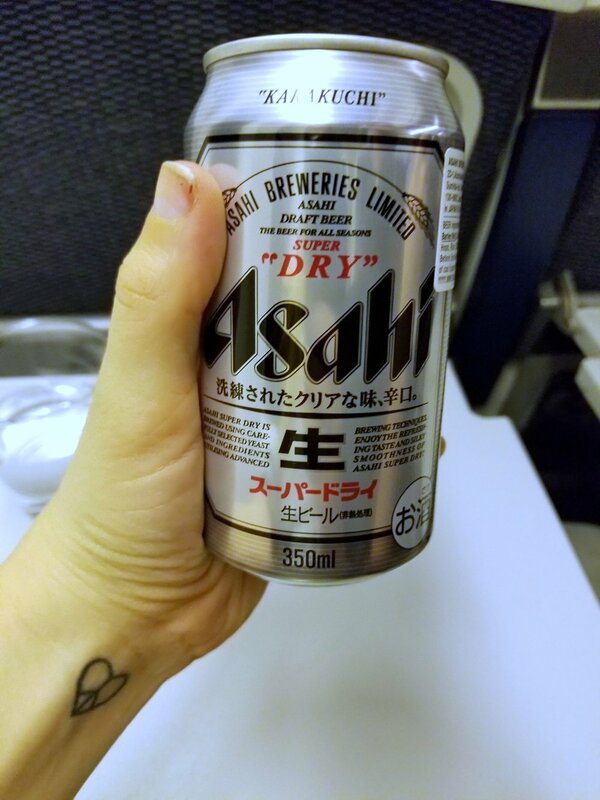 One of my favorite things about international flights- unlimited free alcohol (which, for ANA, included some fun Japanese beers!). So here’s the lowdown on drinks on an ANA flight- pre and post-meal (thus, a total of four times throughout the flight), an attendant will come around and offer you a beverage, whether alcoholic or otherwise (I believe there is wine, beer, some spirits, limited soft drinks, green tea, and water). Between these trips, you will be offered hot green or kaga-houji-cha (roasted green) tea (which is, by the way, DELICIOUS). And, of course, at any time, you can call over a flight attendant and order a drink. While this was plenty of hydration opportunities, I would highly recommend adding a large refillable water bottle to your packing list to fill up and bring with you on the plane and ordering water as early and often as possible during the flight. Long distance flights are always really dry and staying hydrated is one of the best ways to decrease jet lag and keep your face looking fresh for when you get to your final destination! Our flight on ANA was all around pleasant, with incredibly courteous flight attendants. Did you hear about when a rail company in Japan publicly apologized when a train departed twenty seconds early? Something similar happened on our outbound flight- while we were on the tarmac, an attendant announced that, due to some back up on the runway, our flight would be slightly delayed. Justin and I shot knowing glances at one another, assuming that a “slight delay” might actually turn into a couple of hours of being stuck on the runway. The announcer immediately came back over the intercom, indicating that we should be leaving within the next five minutes- definitely, DEFINITELY much shorter than we anticipated and ultimately, our plane took off prior to the scheduled departure time. The model of planes we took had my favorite kind of set-up- two seats by both windows with an aisle running down each side, separating the middle row of seats. Snagging one of the two-seat window rows, Justin and I both got to sit at our ideal seat- I got to rest my head by the window, while much taller Justin got to sprawl out a bit (as much as a tall dude can sprawl on an airplane) into the aisle. Plus, with the two aisle setup, you can get up and occasionally do a lap around the plane, when it gets to the point in the flight where you’re no longer sure if your legs work anymore. Win win! Despite our enthusiasm for the plane layout, we were fairly dismayed that we could not, for the life of us, get our chairs to recline on our outbound flight. We chalked it up to either some supremely bad luck that neither of our chairs happened to work or that our lowly coach seats were not accompanied by the pleasure of reclining. Unfortunately, sitting at a 90 degree angle definitely isn’t the most conducive to sleeping on a 15-hour international flight. On the way home, however, we realized that our chairs reclined the whole time, we were just using them incorrectly- instead of reclining the back support portion, the seat of the chair slides forward, thus moving the chair into a supine position. If you have one takeaway from this article, it is to never assume your airplane seat doesn’t recline prior to attempting to scoot that booty forward. All of that time spent not sleeping on the first leg of our flight allowed me to explore the in-flight entertainment system. The selection was decent, with several new releases, tending toward superhero blockbusters, and older classic films (it was an excellent opportunity for me to watch the three-hour long Green Mile for the first time) that you can watch on your private screen in the seatback in front of you. If your taste veers more towards independent films, however, I may recommend downloading some content from Netflix or HBO Now for your inflight entertainment (...or you know, you could go the prehistoric route and read!). My final recommendation for an ANA flight (or really, any flight)- make sure you dress in layers! On our flight to Japan, the cabin got VERY warm- so warm, in fact, that I wound up digging through my carry-on so I could change into the coolest outfit I could find. On the way back home, however, the cabin was a totally normal airplane temperature (which, for me, is always a bit chillier than I’d prefer). So come armed with a breezy top with a couple of warmer layers over it- it’s always best to be prepared! All in all, I left our ANA flights stuffed with decent plant-based food and thousands of miles closer to adventure. Despite a few mishaps, I would definitely recommend and fly with ANA again, due to their great service, attention to detail with respect to our vegan meals, and reasonable prices. What was your experience like flying to Japan? In your experience, what's the most vegan-friendly airline? I’ve had a really positive experience on WOW Air as well and wondering what else is out there! Let me know in the comments below!